Hardwood flooring is one of the most coveted features in a home. People adore hardwood because of how elegant and attractive it is. Nothing is more beautiful than seeing natural sunlight cascading over a large space covered in natural wood. It is rare to find a high-quality home that doesn’t have hardwood flooring throughout its rooms and halls when you browse DIY channels or flip through home décor magazines. Of course, hardwood flooring isn’t just loved because of the way it brings beauty to a home. Wood floors are extremely durable and practical. They enrich the way you can use any space. Are you considering adding hardwood floors to an existing home or new construction? You will find that no other option out there can truly compete with wood flooring. Take a look at the benefits of wood flooring that you need to know about. The hardwood floors you pick out today will last for a lifetime. That means you won’t have to worry about ripping up your floors in a few years the way you might if you go with another option. Many of the flooring trends involving other flooring materials come and go in the blink of an eye. This makes rooms look outdated in just a few years. However, you’ll notice that even homes that are 50 years old still look classic and timeless if they have hardwood floors. The long lifespan of hardwood will work to your advantage whether you plan to stay in a home for the rest of your life or your intention is to sell it in a few years. The value of your home will remain without the need to redo your floors once you've installed hardwood. Of course, part of the reason why hardwood has such a long lifespan is because it can simply be maintained instead of being replaced. A high-quality wood floor can be sanded and refinished several times. A home with hardwood flooring is instantly more desirable when placed on the market. In fact, wood flooring is one of the top selling points of any home. It is very likely that you will more than earn back any investment you make in hardwood flooring when the time comes to sell your home. Hardwood floors are tough to beat when it comes to the cleanliness factor. Anyone who has ever lived in a home with carpeted rooms knows just how difficult carpets are to clean. Dirt, crumbs and allergens all become trapped inside the fibers of carpets quite easily. This can be a nightmare for anyone who suffers from allergies. In addition, it can be difficult to keep up with the need to vacuum a room constantly and have it professionally cleaned several times a year. Stains and odors also seem to stick to carpets. None of these problems exist with hardwood flooring. You can enjoy a smooth, glistening surface where nothing can hide. In addition, wiping up spills and messes is a breeze with hardwood floors. Hardwood flooring is strong. Today’s high-quality wood floors are manufactured in a way that meets the highest standards. In fact, manufacturers must be able to create hardwood flooring that is able to sustain heavy foot traffic and wear and tear. This level of durability makes hardwood an ideal option for busy areas of a home or office. The strength offered by real wood means that you’ll never have to worry about hearing hollow sounds or vibrations when you’re walking over your floors. The selection of hardwood flooring available today is virtually limitless. Hardwood styles are available in a huge assortment of finishes, sizes, stains and colors. You can choose from everything from thick planks that have been finished to look like white aspens to thin planks done in dark oak finishes. You can really choose a style of wood flooring to create any style theme in your home. Modern styles and stains can create a fresh, bold look that is perfect for homes with open layouts. Classic styles can help you to update an existing space to stay true to the time period it was built in. The way that hardwood flooring looks so seamless is easy to admire. There is no need to live with looking at grout lines or lumps when you have wood flooring. You can simply enjoy a smooth transition that goes from room to room. Touching up grout lines, scheduling appointments to have carpets cleaned and constantly purchasing special products to maintain your floors won’t be necessary when you have wood flooring. Simply vacuuming and mopping your floor weekly is all that’s necessary to keep wood looking its best. This can save you so much time and money. There are some aspects of your home that demand the best quality you can deliver. The flooring you choose really sets the pace for how every other aspect of your home's interior will look and feel. 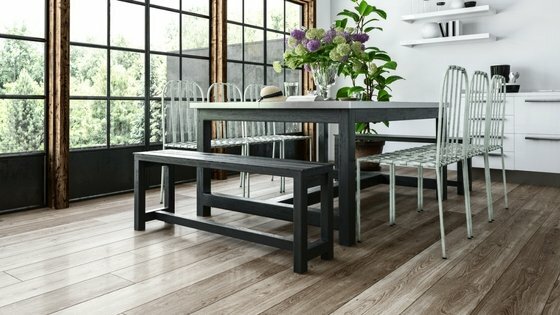 The good news is that it has never been easier to pick out high-quality, beautiful wood flooring on any budget. What's more, picking out your new flooring is such a fun process. Nothing feels better than walking into a room of your own that features gorgeous wood flooring that you know you can take pride in for a lifetime to come!